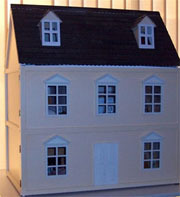 This is my first dolls house (but it won't be my last) just how it looked originally. I actually paid too much for what turned out to be a cheaply made kit. I have tried to make the best of it and I hope you like the finished result. 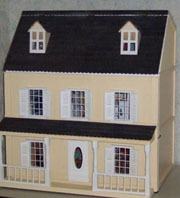 Here is a house I bought cheaply from eBay because I love the front. It was in a very poor condition so I scrapped the rest, except for the staircases which I sold on eBay recouping half the cost of the whole thing. 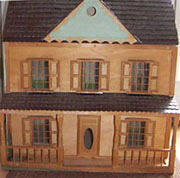 This is how it looks with the two married together and the roof raised. It now needs furniture and stained glass for the front door and some interesting items on the porch. Doesn't it look better now? 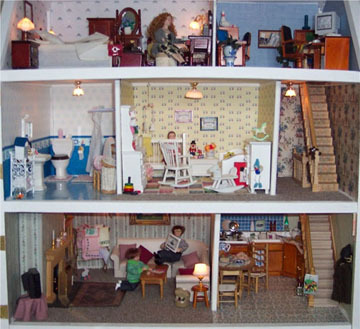 It was really difficult to furnish the top floor of this doll's house because of the sloping ceilings(see picture above left). Then along came my husband Colin and he raised the roof...literally. First he removed the entire roof section, not difficult as I hadn't glued it, then he added a wall at the back of the attic. The gable walls had to be completely re made to accomodate the new shape. A strip of the back roof was removed as the new angle made it overhang a lot (this strip came in handy to match the tiles on the porch roof later) The front roof piece stayed exactly as it was and then the whole thing was replaced. That's when we realised I would also need a new dividing wall inside too, again because of the new shape. This shows how the rooms are laid out. Because the floors have a ledge all around them. I was able to use real carpet without it looking too thick, but the kitchen and bathroom floors are computer printoff's on photo paper. 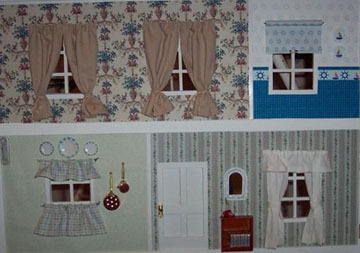 The entire front wall opens to reveal the dollhouse interior. The photograph at the left shows how I decorated the inside of the front wall.